Amoxicillin is a moderate-spectrum antibiotic for cats and dogs belonging to the class of penicillin. This medication inhibits the growth of bacteria by preventing the cell wall formation of the bacterial cells. Amoxicillin should be used only to treat bacterial infections and not for viral and parasitic infections. The usual dose of amoxicillin in dogs and cats is 5-10 mg/lb every 12-24 hours. Amoxicillin is currently available both as drops or capsules. What is Alphamox Oral Suspension used for? Alphamox Oral Suspension 250 mg/5mL is a broad spectrum antibiotic used to treat common infections in adults and children caused by a variety of bacteria in different parts of the body. These include upper and lower respiratory tract infections, such as bronchitis, tonsillitis, sinusitis, pharyngitis and pneumonia; otitis media (ear infection); urinary tract infections such as cystitis and urethritis; infections of the skin and soft tissue like cellulitis and impetigo. Alphamox Oral Suspension 250 mg/5mL is also use for prophylaxis (to prevent) against bacterial endocarditis (infection of the heart valves and lining), which can develop after some surgical procedures such as dental extraction. How does Alphamox Oral Suspension work? Alphamox Oral Suspension 250 mg/5mL contains amoxicillin, which is a broad spectrum antibiotic similar to penicillin and belongs to the beta-lactam group of antibiotics. Amoxicillin in Alphamox Oral Suspension 250 mg/5mL contains a structure called the beta-lactam ring, which blocks the formation of the bacterial cell wall in susceptible bacteria, and this kills the bacteria. Alphamox Oral Suspension is effective against a wide range of common bacteria found in general practice and in hospitals including: Streptococci and non-resistant Staphylococci, pneumococci, Haemophilus, Neisseria; Escherichia coli, Proteus mirabilis, among others. However, amoxicillin can be inactivated by an enzyme called beta-lactamase, produced by resistant bacteria, such as some staphylococci, which destroys its beta-lactam ring and makes those bacteria resistant to amoxicillin. Alphamox Oral Suspension does not work against viruses which use a different mechanism to grow and replicate. What does Alphamox Oral Suspension contain? Alphamox Oral Suspension contains the active ingredient amoxicillin trihydrate, a beta-lactam antibiotic similar to penicillin, which is used to treat a wide range of bacterial infections. It also contains Sodium benzoate, propylene glycol alginate, silica - colloidal anhydrous, disodium edetate, sodium citrate, sorbitol, raspberry flavour permaseal 10458-31 and the artificial sweetener aspartame, which is a source of phenylalanine. When reconstituted, each 5 mL contains 250mg amoxicillin trihydrate. Alphamox Oral Suspension contains amoxicillin, a broad spectrum antibiotic similar to penicillin that is used to treat common infections in adults and children caused by a variety of bacteria in different parts of the body. These include upper and lower respiratory tract infections, urinary tract infections, infections of the skin and soft tissue, and for prophylaxis (to prevent) against bacterial endocarditis (infection of the heart valves and lining), which can develop after some surgical procedures such as dental extraction. Amoxicillin in Alphamox Oral Suspension 250 mg/5mL contains a structure called the beta-lactam ring, which blocks the formation of the bacterial cell wall in susceptible bacteria, and this kills the bacteria. Alphamox Oral Suspension does not work against viruses which use a different mechanism to grow and replicate. What are the side effects of Alphamox Oral Suspension? The most commonly reported side effects when taking Alphamox Oral Suspension include diarrhoea, nausea, vomiting, stomach pain, skin rash, urticaria (hives) candidiasis (oral and vaginal thrush). 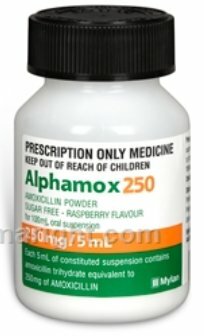 What is an allergic reaction to antibiotics like Alphamox? 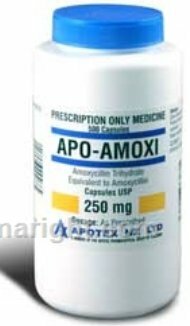 Some people are allergic to penicillin-like antibiotics like Amoxicillin in Alphamox Oral Suspension 250 mg/5mL and may develop a hypersensitivity reaction, which can be a mild to severe skin reaction, with symptoms like rash, itching, blotchy red patches, hives (urticaria), dermatitis. A more serious reaction may give you symptoms like swelling of the face, lips, tongue or other parts of the body, shortness of breath, wheezing or trouble breathing. When should Alphamox Oral Suspension not be used? How should Alphamox Oral Suspension be taken? Make up your Alphamox Oral Suspension by following the instructions provided. Add 80 mL purified water to make up 100mL and shake well to form a suspension containing 250 mg/5mL. Before taking each dose, shake the bottle again. You can take your Alphamox Oral Suspension with or without food. The dose you take depends on what you are being treated for and your doctor’s recommendation, which is usually 250mg every 8 hours, but for severe infections may be increased to 500mg. For children (under 20 kg) the dose given should be 25 mg/kg/day in equally divided doses every 8 hours, which may be increased to 50 mg/kg/day for severe infections. You should continue to take your Alphamox Oral Suspension 250 mg/5mL for as long as recommended by your doctor, and complete the full course prescribed is complete, even if you feel better, otherwise the infection may not clear completely or your symptoms may return. How long should you take Alphamox Oral Suspension? You should continue to take your Alphamox Oral Suspension for as long as recommended by your doctor, and complete the full course prescribed is complete, even if you feel better, otherwise the infection may not clear completely or your symptoms may return. If you miss a dose of Alphamox Oral Suspension 250 mg/5mL take it as soon as you remember, unless it is time to take the next dose, then skip the missed dose. Do not take a double dose. How should Alphamox Oral Suspension be stored? You should store your Alphamox Oral Suspension 250 mg/5mL below 25°C in a cool dry place while in powder form. Once the powder is reconstituted in water refrigerate between below 2-8°C and use within 14 days. Do not freeze.